With the completion of its deal with Torrent Pharma for Rs 2,000 crore involving sale of select brands, Elder Pharmaceuticals Limited (BSE: 532322 | NSE:ELDERPHARMEQ) has laid out aggressive expansion plans for achieving a turnover of Rs 1000 crore by FY 2017. In addition to its thrust on the Anti-infectives, Multi Vitamins and Skin care segments, Elder has identified the fast growing mouthwash category in the Oral c are industry as its focus area and to this effect has relaunched its famous AMPM range of mouthwash with an addition of a range for Smokers / tobacco users. Indian oral care industry, over the last few years, has been one of the fast growing FMCG sectors. The oral care industry is segmented into five categories which include toothpaste, toothbrush, toothpowder, mouthwashes, other oral care products such as dental flosses and chewing gum. Developed by the R&D scientists at Elder Pharma in joint co-operation with practicing dentists, the new AMPM Mouthwash has as its key ingredient ‘Triclosan’, an antibacterial and antifungal agent. Triclosan has been shown to be effective in reducing and controlling bacterial contamination and fighting germs. In addition to its anti plaque and anti cavity properties, AMPM has been designed to fight gum recession, dry mouth, tobacco odour, tartar build up and tooth staining from smoking, yellowing or browning of front teeth due to exhaling tobacco smoke. AMPM is available in 3 variants AMPM PLUS, AMPM SPECIAL and the newly launched AMPM NICOFRESH specially formulated for smokers/tobacco users. Smoking not only causes bad breath but leaves stains on teeth and leads to gum diseases. 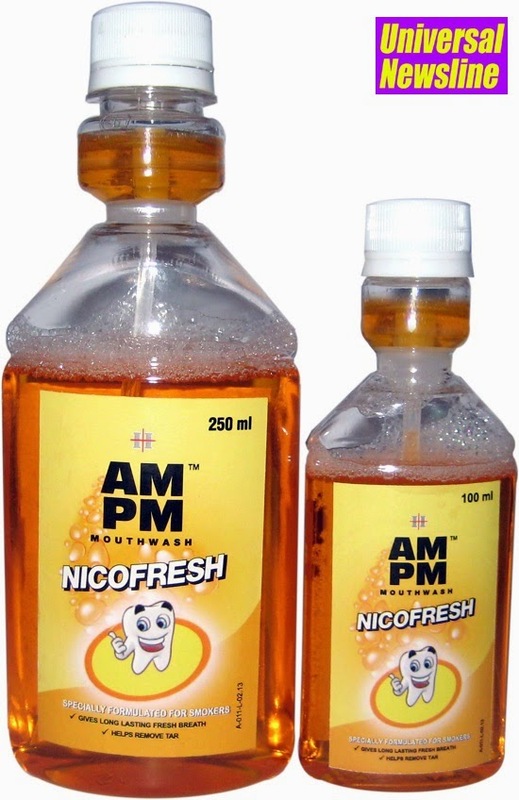 In addition to TRICLOSAN, AMPM NICOFRESH contains Sodium Perborate which helps remove smoke and tobacco tar. The oxygenating effect of NICOFRESH hits one of the most stubborn sources of sulfur-producing bacteria and stops it at its source. Going ahead Elder is also planning to launch mouthwashes based on natural ingredients like aloe vera, green tea and probiotics under the AMPM range. The Domestic mouthwash industry is presently valued at Rs 600 crore and growing at 25 – 30% pa. Online ecommerce players and organized retail chains are also playing a major role in the market expansion of mouthwashes as oral health & hygiene awareness increases by the day. The leader in the mouthwash category is Listerine which accounts for 70% of market share while Colgate Plax has 17% share. Elder hopes to garner a 5-7% share in the next few years. Elder’s growth strategy is to lay emphasis on expanding the brands remaining with itself post Torrent deal and strengthening them rather than launch new products. New products are also in the pipeline but will be introduced in a phased manner once the existing brands reach a critical level. Elder group’s target of Rs 1000 cr turnover by 2017 will see equal contribution from its domestic and international operations.